Here’s the thing about Instagram: that one of a kind shot you just posted? It’s been done before. Like, so many times. We ran the numbers to show that everyone is pretty like-minded when it comes to snapping shots of Philly. So here are the top 20 spots around town to snap that photo. Apparently, people love the ZOO, and, OMG, so many cute animals to photograph. Kelly Drive is the perfect spot for that post-workout selfie because everyone looks good when this is the background for your run. Be it doughnuts from Beiler’s or roast pork from Diic’s, people love snapping shots of the delicious food found throughout Reading Terminal. When lit up at night, the 15 boathouses lining the east shore of the Schuylkill River create a scene that no other city can recreate. Whether it’s sitting at one of the tables at Parc or on a blanket in the in the grass, it’s hard to take a bad photo in Center City’s most famous park. A catchall, yes, but South Philly -- in this case, pretty much anything below Washington Ave -- is tagged a hell of a lot in Philadelphians' Instagrams. Occasional late trains and lines are known to dampen the mood inside 30th Street, but it’s worth remembering that the place is pretty damn cool. Designed by Alfred P. Shaw in 1933, 30th Street features art deco styling, massive chandeliers, and 95ft tall ceilings. While the product on the field might not always be worth photographing, Eagles fans love to snap photos while cheering on the Birds (or tailgating in the parking lot). It’s the bar that’s so ugly, it’s beautiful -- so it’s no surprise that Tattooed Mom is a pretty popular place to snap a quick photo. 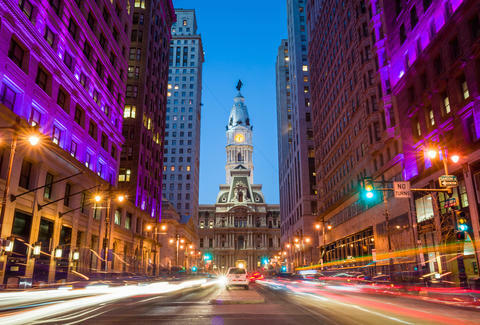 Might seem like an odd favorite, but keep in mind that the Philadelphia Auto Show, Flower Show, and dozens of other events bring hundreds of thousands of camera-happy visitors through the Convention Center each year. South Street’s Magic Gardens, the largest work from local mosaic artist Isaiah Zagar, sees thousands of visitors each year exploring the half-block museum, art gallery, and installation. Turns out more than a few visitors have taken a photo or two. Maybe not the best cheesesteak you can get in Philly, but thanks to endless publicity, the corner of 9th and Passyunk is the most popular area in the city to snag a photo of Philly’s most well-known sandwich. During the summer months, Spruce Street Harbor park is THE place to head because who doesn’t like an outdoor drinking photo. Unless you have an apartment overlooking the Delaware, Race Street Pier is the best spot in the city to grab a sunset shot of the Ben Franklin Bridge. The best place to grab a shot of City Hall? Right smack dab in the middle of Broad Street, across from the Union League. Just mind traffic while snapping that selfie. It’s the only place where you can shop for groceries amidst flaming garbage cans (for an old school heat source, not garbage-burning purposes) -- that is, unless you do your shopping in Camden. Whether it’s an action shot or one with fists raised in the air, taking a photo on the Art Museum steps (aka the Rocky Steps) is a must for anyone visiting Philly. Both locals and tourists LOVE (hyuck, hyuck) to snap photos in front of Robert Indiana’s famous statue in JFK Plaza (the actual name of Love Park). One of the symbols of American Independence, the Liberty Bell and its iconic crack is a photo that’s probably even popped up in your parents’ feeds at some point. Outside of the Liberty Bell, there isn’t a more famous photo op in Philadelphia than in front of the building where the founding of the country went down. Dan McKay swears he didn’t make this list based on his Instagram profile... You can follow him on Instagram (or Twitter) @dannypageviews.